Total dividends are on track to increase 30.5% as credit unions take advantage of the rising interest rate environment. Analysts from Callahan & Associates project total dividends at credit unions totaled $8.4 billion at the end of 2018. This $2 billion increase over last year represents an annual growth rate of 30.5%, the highest since 2006 and 18.2 percentage points stronger than credit unions reported in 2017. Dollar for dollar, credit unions haven’t given back this much since 2010, when they returned almost $10 billion. Analysts at Callahan & Associates project total dividends in 2018 reached $8.4 billion, which is nearly $2.0 billion more than credit unions returned in 2017. 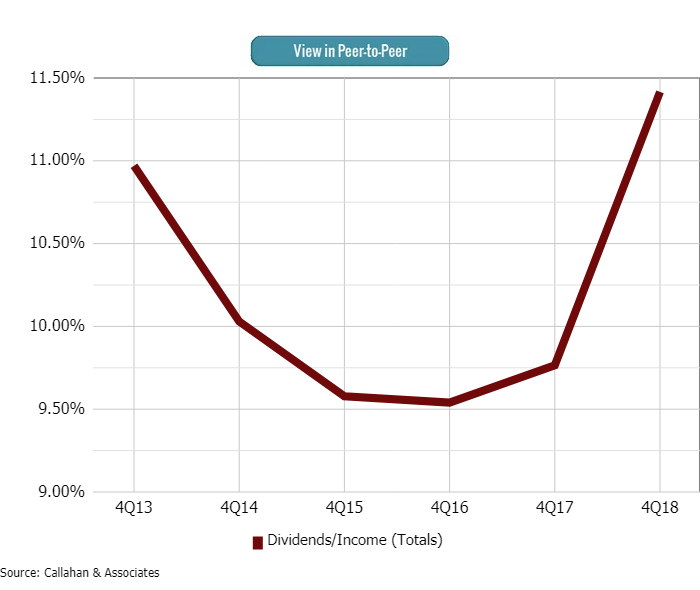 For the past decade, the year-over-year change in dividends per member has not exceeded $4.0; however, Callahan analysts predict it jumped $14 in 2018 as the average dividend per member increased to $71. The increase in this metric is the result of expected dividend growth, at 30.5%, outpacing expected member growth of 4.5%. The dividend per member for U.S. credit unions is on pace to hit $71 at year-end 2018. The financial services industry is in a rising rate environment, and credit unions are returning more of that interest earned to members. Total income for the fourth quarter of 2018 is on track to increase 13.0% to $74.5 billion. More than two-thirds of that income — 64.1%, or $47.7 billion — is coming from interest on loans. In 2017, credit unions returned 9.8% of their total income in the form of dividends; they are on track to return 11.3% in 2018. The rising rate environment has perfectly positioned credit unions to show members that cooperative institutions are all about increasing member value. Credit unions are on track to return 11.4% of their total income to members in 2018. 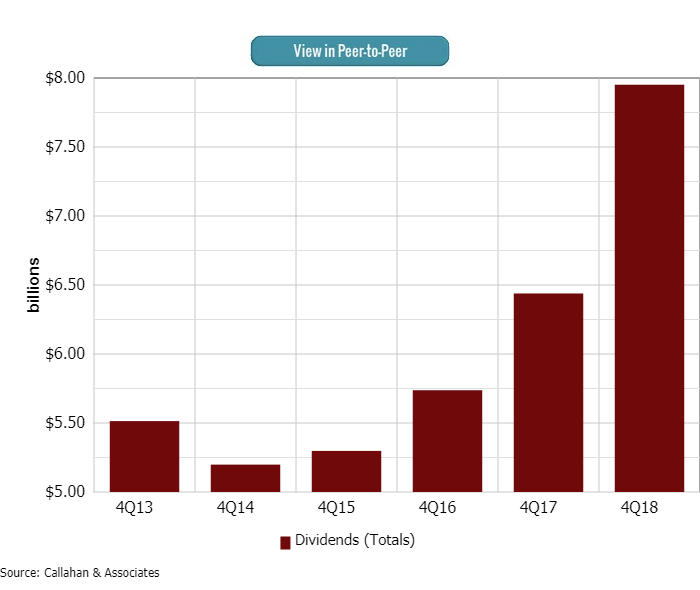 Caltech Employees ($1.7B, La Canada, CA ): Caltech Employees Federal Credit Union distributed $25.5 million to members in 2018 in the form of dividends on shares. That’s up 56.2% from 2017. On its website, the credit union promises to provide members “superior financial value” through higher dividends and lower rates on loans. The $25.5 million the cooperative gave to members was almost half — 49.6% — of its total income. The average dividend per member for the credit union in 2018 was $739, an increase of $258 from 2017. USAlliance Financial ($1.7B, Rye, NY): USAlliance Financial Credit Union gave back an average of $109 per member in the form of dividends, a $31 increase from last year end. USAlliance Financial increased their total expenditure on dividends 61.5% year-over-year, from $7.9 million as of year-end 2017 to $12.8 million as of year-end 2018. This credit union advertises their “High Dividend Savings” on their website, a savings product with a “true” variable rate that is maintained monthly and is currently at 2.36% APY. Premier Members ($1.1B, Boulder, CO): Premier Members Credit Union boasts about its market-linked certificates, a savings product with a variable rate that allows members to take advantage of changing market rates in this rising rate environment, on its website. The credit union gave back $6.8 million — 12.3% of its total income — in dividends to members throughout 2018. 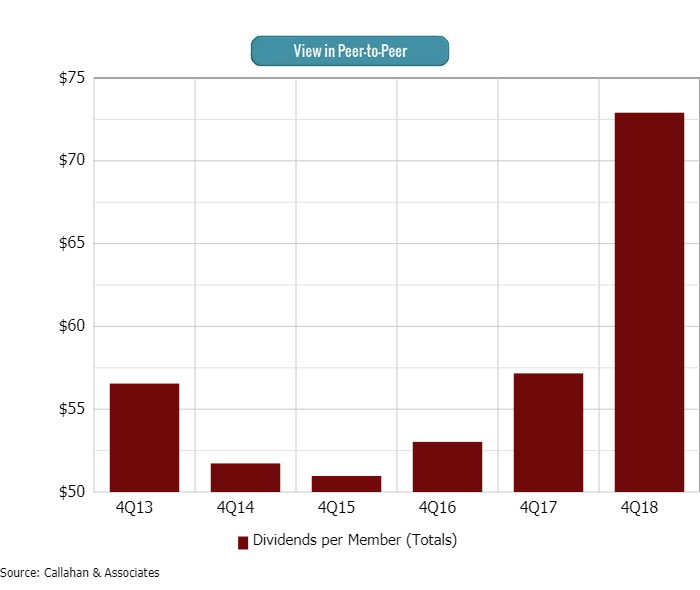 The average dividend per member at the credit union was $95, an increase of $40 from last year-end. Go beyond the national averages and dive deeper into individual credit unions, peer groups, state, and more using Peer-to-Peer. Let us walk you through your numbers with a custom performance audit.